Emphasise your arches with BBB London Brow Build Gel; a volumising formula that enhances natural shape and adds dimension to your face. 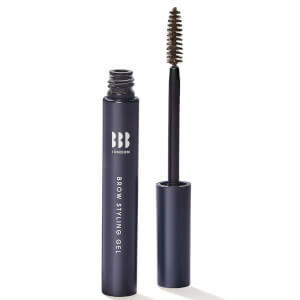 Developed by the premium English brow specialist brand, the easy-to-use microfibre brow gel enables you to create fuller-looking, expertly defined eyebrows with hair-like colour that lasts. Brows are shaped and styled to perfection. Brush through brows in short, light strokes for definition and instant volume. Aqua, Stearic Acid, Copernicia Cerifera Cera, Silica, C30-38 Olefin/Isopropyl Maleate/Ma Copolymer, Triethanolamine, Cetyl Alcohol, Adipic Acid/Diglycol Crosspolymer, Panthenol, Nylon-66, Paraffin, Caprylyl Glycol, Cera Alba, Propylene Glycol, Euphorbia Cerifera Cera, Vp/Eicosene Copolymer, Polysorbate 20, Hydroxyethylcellulose, Cera Microcristallina, Simethicone, Argania Spinosa Kernel Oil, Disodium Edta, Macadamia Integrifolia Seed Oil, Tocopheryl Acetate, Polysorbate 65, Triethoxycaprylylsilane, Synthetic Wax, Methylcellulose, Sorbic Acid, Polyethylene, Benzoic Acid, Sulfuric Acid. May Contain +/- Ci 77891 (Titanum Dioxide), Ci 77492, Ci 77499, Ci 77491 (Iron Oxides).